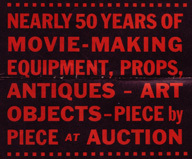 While you might expect such an auction to appeal to curious fans and collectors hoping for rare movie props and file cabinets full of still photos, it’s clear from the auction catalog that professionals from the film industry were the ones being targeted. Items included all types of filmmaking equipment. Obvious items such as cameras, lights, and sound equipment were listed alongside office furniture, and equipment from the machine shop, the special effects department, and the studio cafeteria. Since all of the buildings were to be town down, even the doors, windows, and light fixtures were up for auction. The hand hewed wooden beams from Mr. Roach’s office were highlighted in one photo. The cover of a large format, eight page auction catalog that was circulated to promote the sale. The auctioneers were obviously in a quandary. On the one hand the lot had been operating in Culver City for 44 years–since the silent era. There were a lot of items in the prop department that would appeal to collectors and antique dealers. But the real money was in the filmmaking equipment, and antiques in that field had no real value. 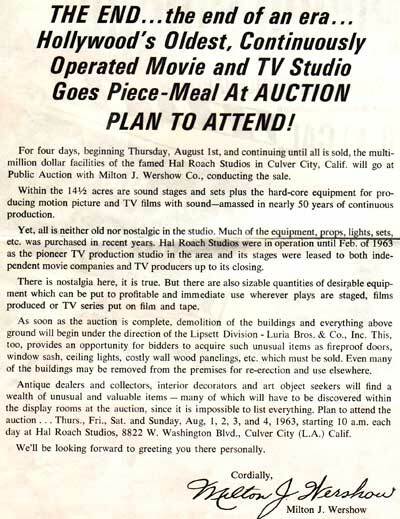 While there was some hint of nostalgia for the old studio, the auction catalog attempted to emphasize that it was a modern, working facility prior to its closure. There was no mention of the studio’s resident stars from days-gone-by. 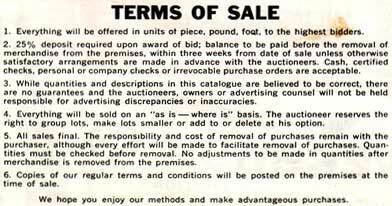 The description and terms of the auction, as reproduced from the inside of the catalog. While some memorabilia purchased during the auction has surfaced over the years, the whereabouts of most items are still unknown to this day. Just how many props and sets made it to other studios or nearby theaters remains a mystery. Many items must have remained until the bulldozers finally razed the lot. Imagine how different things would be if the studio were closing down today! Maybe they could have stayed in business with just the funding from auctioning their rare photos and posters on eBay. I was 14 yrs. old at the time and lived within bus distance to the studio. I knew it was a famous place so my friend Mike and I took the Culver City bus there on one of the preview days. They wouldn’t let us in because we were under 18, so we waited until we saw this couple going in and asked if we could go in with them. But sure enough there was the outdoor NY street where Abbott and Costello and Amos and Andy were shot. And a western street. It was a jewel of a little studio. Too bad they tore it down. The irony is that they built huge storage warehouses on the property, which when the economy tanked, were used as sound stages. Steven Cannell used them as his sound stages. Alf was shot there as well as most recently the movie Team America. At the Hollywood ’80 convention, there was one memorabilia dealer who had all manner of rare stills and scripts from the L&H films (actual scripts?! We’d never seen THOSE before!) which he’d had since the auction in ’63. I was doing the research for my book at the time these showed up. I bought as many stills as I could afford, but since the scripts were going for $35 each, I could only get one of those (“Scram!,” one of my favorites). A bunch of us bought one script each and agreed to make copies for each other. After that, I talked to this dealer, Douglas Hart, and explained that I needed to look through those scripts for research purposes, as one of the key points of the book was to describe how the films changed from initial idea to final product. He very generously allowed me to come to his store–Backlot Books, on Sunset and Poinsetta, I recall, a little shack next to a barber shop, and only open on Saturdays–and read the scripts into my trusty cassette recorder. He wouldn’t let me make copies, but he would let me dictate them. Consequently, I have lots of tapes of me reading these scripts at a furious pace. I remember spending many a Saturday sitting on a milk crate and dictating them as fast as possible. I think I actually typed up a few of these, but later I’d just listen to the tapes and make notes on what was different in the scripts. Anyway, this is the type of adventure you encounter when doing research for a book. Amazingly, as soon as I got through all of the scripts from this source, a book-dealer friend of mine told me about another rare book dealer who had just acquired a collection of L&H scripts. Turned out that *these* scripts were exactly the ones that the first guy didn’t have! He, too, let me dictate these into my cassette recorder. I think somebody up there was helping me on this project–there were just too many spooky coincidences like that for me to think otherwise. Ultimately, there were only a handful of scripts I never got to see. Sadly, among them were “Two Tars,” “Big Business,” “The Music Box” and “Sons of the Desert”; strangely, “The Bullfighters” was missing from the Fox collection at USC, which otherwise was amazingly complete, having initial treatments through final revised drafts on all the other L&H films. 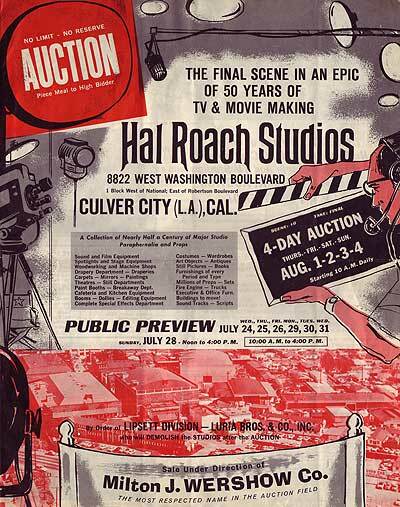 I for one am *very* grateful that so much stuff was still available to be sold at the Roach Studio auction. I remember Roy Seawright telling me that when the studio was taken over by the government in 1942, he was ordered to pitch boxes of scripts and stills and who knows what else into an incinerator, because they needed more space to make those army films. I also remember Marvin Hatley telling me he went to the auction to try to find some of his scores; he did find the conductor’s copy for “Block-Heads,” and I have some of that in xerox copies. He also got the conductor’s copy for “Of Mice and Men,” which he gave to me.